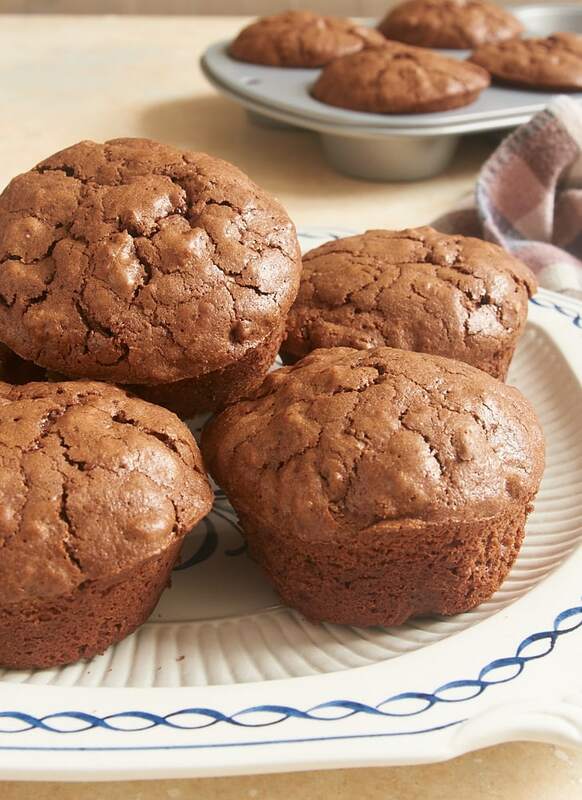 Brownie Cupcakes are quick and easy brownies made in a muffin pan. No cutting or slicing with these. Just grab your own brownie and enjoy! As much as I love traditional fudgy brownies, I am always trying to find or come up with some twist on the classic. These Brownie Cupcakes are a simple way to do something just a little different than your usual brownies. This Brownie Cupcake recipe doesn’t fit neatly into any one category. Sure, they’re brownies. But they have a lovely cake-like texture. And they’re baked in a muffin pan. So, you’ve got a lot of different influences here. Regardless of how you label them, these little treats are a fun and tasty way to change up your brownie routine. These brownies are pretty great just as they are with no extras added. But for a little something extra, you can add a surprise inside these brownies. 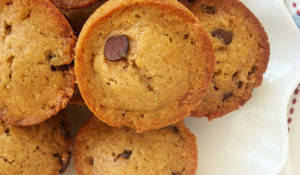 Once you fill the muffin cups about half full, just drop in a few milk chocolate or white chocolate chips before filing the cups the rest of the way. Or how about peanut butter chips or butterscotch chips? 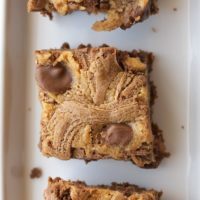 You’ll create a little pocket of extra flavor in the center of each brownie. 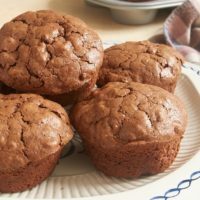 If you’re looking for a quick-and-easy, one-bowl, sure-to-please dessert, you’ve found it with these Brownie Cupcakes. You can have these mixed up and in the oven in just a matter of minutes. And once they’re done, you can skip the cutting and serving steps. Just put them on a plate and let everyone grab their very own brownie. The toughest part may very well be waiting for them to cool enough to eat! 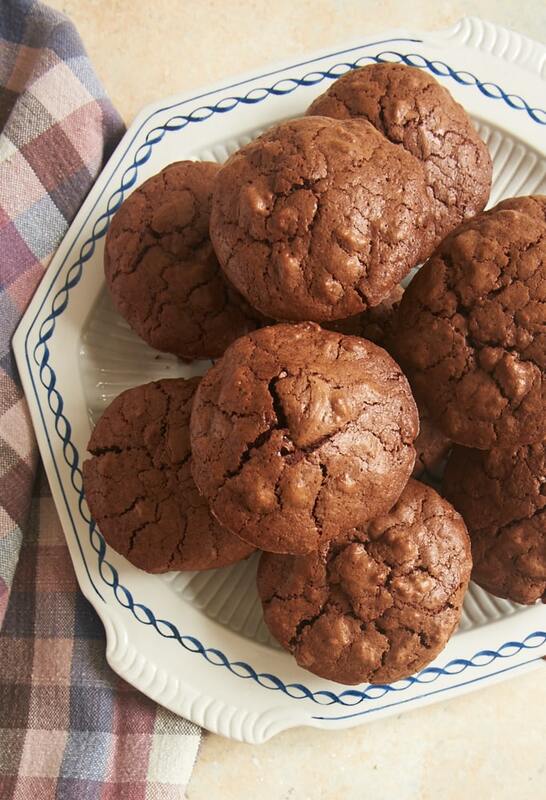 These fantastic Brownie Cupcakes are brownies, muffins, and cupcakes all at the same time! Place semisweet chocolate and butter in a microwave-safe bowl. Heat at half power in 30-second increments until the butter has melted and the chocolate melts when stirred. Stir until smooth. Set aside to cool. Preheat oven to 350°F. Grease 12 standard-size muffin cups or line them with paper liners. Add the eggs, sugar, and vanilla to the cooled chocolate mixture. 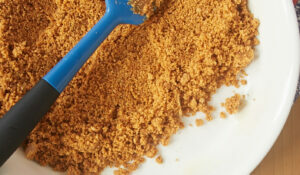 Use a mixing spoon or an electric mixer to mix until thoroughly combined. Stir in the flour and salt, mixing just until combined. Stir in the nuts. Fill each muffin cup about half full. Place about a tablespoonful of flavored chips on top of the batter. Cover with the remaining batter, filling each cup almost full. Bake 30 to 35 minutes, or until a pick inserted into the center comes out with moist crumbs. Cool in the pan on a wire rack. Recipe slightly adapted from Guittard. These look really good. They will travel well like in school lunches. These look great. 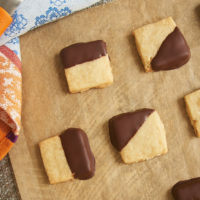 Very similar to ones I have made before from Martha Stewart and they are delicious. 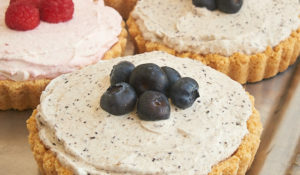 Great topped with whipped cream. 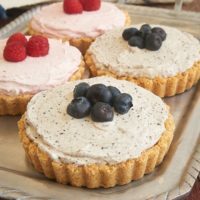 Love your blog and recipes….everything I have made is very good! I have your cookbook too…everything is marked as a must try. mmm choco-choco-chocolateyyyy! I love that these are like…sorta cupcakes…sorta brownies–and ALL delish! Brownies and cupcakes in one?! What a great idea! 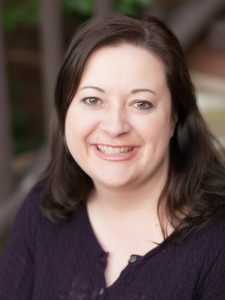 Hey Jennifer, I love to bake and I love your site. 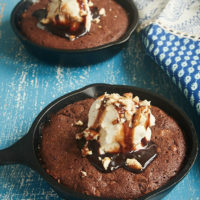 I am a new reader and would like to know if I could add a little chocolate chip cookie dough to the middle of this brownie? Hi, Wanda. I’ve not tried that, but I think it would work in theory. Depending on how much you use, you may need to use less brownie batter per cup. If you try it, be sure to let me know how it works. Hi, Diane. 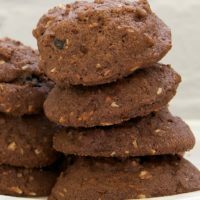 With few exceptions, nuts are optional in recipes where they’re just mixed into a cupcake, cookie, brownie, etc. Omitting them will result in a little less batter, so just keep that in mind when you’re portioning them. Or just add more chocolate chips if you like! The batter was so delicious! Guilty- I eat from the batter LOL. Mine came out dry. I cooked them for 25 mins and checked them. I thought they were a bit too runny still, so I baked them for 2 more mins. Are they supposed to be dense or chewy? They should be a little on the dense side, but not dry. Depending on how you measure your flour, it’s possible you added too much to the batter. Made these today. 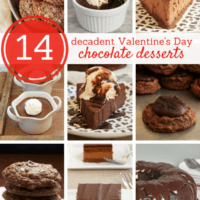 I do not like chocolate (I just like to bake); however, these are really good! They get even better the longer they sit. I’m glad you liked them, Patricia! Can you just use semi sweet choc chips?